365. viksharah om viksharAya namah He who never wanes. SrI Sankara bhAshyam is "vigatah ksharah (nASo) yasya asau viksharah" - One who has no decay. SrI BhaTTar gives the interpretation that bhagavAn's love for His devotees never diminishes, and He is vikshara by this reason. 366. rohitah - om rohitAya namah He who is of red complexion. kamala garbhAbatvAt rohitah - He who has the red color of the inside of a lotus. SrI v.v.rAmAnujan gives reference to tiruvAimozhi - 8.4.7: "tirucceyya kamalak kaNNum Sev-vAyum SevvaDiyum Seyya kaiyum tiruc-ceyya kamalaundiyum Seyya kamala mArbum". Seyya here means reddish- colored, kamala means lotus. rohita also refers to a species of fish, and SrI Sankara has given the alternate interpretation that it can refer to His matsya incarnation, in the form of a reddish hued fish. SrI satyadevo vAsishTha derives the meaning from the root ruh - bIja janmaniprAdurbhAve ca - to grow, to increase, to rise, to reach, and gives the interpretation "prAdurbhavati iti rohitah - One who expresses Himself or One who causes all beings to express themselves, is rohitah. 367. mArgah om mArgAya namah He who is sought after. ..mArgyate iti mArgah - He is mArgah because He is always sought after by His worshippers. SrI v.v.rAmAnujan gives reference to tiruvAi mozhi nURRandAdi91 - "tAL aDaindAr ta~ngatku tAnE vazhit-tuNaiyAm kALa-megattai" - He accompanies and shows the way to those who have surrendered to Him. SrISankara gives an additional intepretation - He is mArga because He shows the way for the attainment of Supreme Bliss. SrI rAdhAkRshNa SAstri gives another aspect - After the Universe disappears at the time of praLaya, it is He who is the way for the world's re-appearance. 368. hetuh om hetave namah The Cause. He is the cause for the realization of the desires of His devotees. Sri Sankara gives the interpretation that He is both the instrumental and material cause of the Universe. The dharma cakram writer nicely distinguishes between bhagavAn the Cause, and bhagavAn the effects. He points out that in general we see the effects, but we don't see the cause behind the effects as easily. This is true in the different aspects of life - we use the Universe, but we don't understand bhagavAn who is the Cause of the Universe. We see the body, but we don't see the five elements which are the constituents of this body. He is visible as the Cause of the Universe only to the yogi-s and the j~nAni-s.
1) He who has the worlds in His belly. 4) One who is attained by observances such as damA.. The word dAma can refer to a rope, the worlds, happiness, etc. The word udaram means belly. Based on these, there are different interpretations. 2) dAmnA udare baddha iti dAmodarah - One who was tied around His waist with a cord. The support for this interpretation is from brahma purANa: "tayor madhya-gatam baddham dAmnA gADham tayodare | tataSca dAmodaratAm sa yayau dAma bandhanAt || (brahmapuRaNa 76.14) (Note: The reference to the above is given differently in the different vyAkhyAna-s as stanzas 5.6.20, 184.41, and 76.14. Since I do not have a copy of brahma purANa with me, I could not verify the correct reference. If any of our readers have the original source, please verify the correct reference and let me know. I would sincerely appreciate it). SrI v.v.rAmAnujan refers us to divya prabandham - veNNei vizhu~nga veguNDuAicci kaNNik kayiRRinAl kaTTat tAn kaTTuNDirundAn - mUnRAm tiruvantAdi. SrI A. SrInivAsa rAghavAcArya svAmi in his interpretation in tamizh in SrI nRsimha priyA points out that the act of bhagavAn willingly getting Himself tied around with a rope just demonstrates that He becomes a bhakta-para-tantran i.e., He subjects Himself to His devotees' wishes. In this case, He subjected Himself to yaSodA's wish that He be constrained by the rope. He even shed tears when He was tied in order to please her. 3) SrI BhaTTar gives an additional interpretation based on "devAnAm sukhasamSitvAt dAmAt dAmodaram viduh" (udyoga parva 71.9)- They know Him as dAmodara because He has "dAma" or joy, indicating happiness for the gods. 4) SrI Sankara has given the additional interpretation - damAdi sAdhanenaudarA (utkRshTA) matih (yA tayA gamyata) iti dAmodarah - One who is known through the mind which is purified (udarA or utkRshTA) by means of self-control (dama) and other qualities. He gives the support from mahAbhArata - damAt dAmodaro viduh (udyoga parva 5.69.8).The dharma cakram writer very nicely remarks that the One who was tied by the rope can be known only by "tieing" or controlling the pa~nca indriya-s and directing them towards Him and His service. SrI rAdhAkRshNa SAstri points out that this nAma has the greatness that at the same time it shows the greatness of bhagavAn in having the whole Universe inside Him and the simplicity of being tied by a rope and contained by His devotee. ..sahate iti sahah. SrI BhaTTar links this nAma to the previous one by pointing that He patiently accepted being tied by the rope as dAmodara. nammAzhvAr sings this patience of Lord kRshNa - ettitRam! uralinODuiNaindirundu E~ngiya eLivE (tiruvAimozhi 1.3.1) - referenced by SrIv.v.rAmAnujan. SrI Sankara vyAkhyAna is that He forgives the lapses of His devotees - sahate sarvAn abhibhavati iti sahah. SrI rAdhAkRshNa SAstri points out that He bears the burden of the Universe for the sake of the welfare of the creatures in the Universe. The dharma cakram writer points out that He patiently waits till we attain the maturity needed to reach Him and be united with Him. He also refers to the incident where He put up with SiSupAla's abusive words more than a hundred times after he had given word to SiSupAla's mother to that effect. This nAma occurred earlier as nAma 319. There the meanings given were that He supports the earth by ridding it of evil-doers, or that He accepts the pUjA from the devotees. Under the current nAma, SrI Sankara gives the interpretation that He bears the Earth in the shape of mountains. He gives reference to vishNu purANa -vanAni vishNur girayo diSaSca - 2.12.37) - The forests, mountains, and directions are all vishNu. He bears the earth by propping it up in the form of mountains. SrI v.v.rAmAnujan refers to His bearing the Earth between His teeth in His varAha incarnation - eyiRRu iDai maN koNDa endai - periyAzhvArtirumozhi 5.2.3. SrI BhaTTar explains that Lord kRshNa has the good fortune (mahA bhAgya) of being chosen for service as their Lord by the cowherdess nILa, sixteen thousand celestial damsels, rukmiNi, satyabhAmA, jAmbavati, and others. SrIv.v.rAmAnujan refers us to tiruvAomozhi - vaDivu iNai illA malar-magaLmaRRum maN-magaL piDikkum mel-aDiyAn - 9.2.10.SrI Sankara gives the vyAkhyAna that He is fortunate in being able to takeany form He likes, or He who gets the best of everything in His incarnations.SrI rAdhAkRshNa SAstri points out that He is mahAbhAgah because He gets the major (mahA) portion (bhAga) of any offering as He likes. He refers us to the incident of the offering by the gopa-s to the govardhana giri instead of to indra at the insistance of kRshNa. Lord kRshNa appeared at the top of the govaradhana mountain and accepted all the offerings. SrI BhaTTar points out that even when He was child kRshNa, His actions were displaying His irresistible supremacy and Lordship. SrI v.v.rAmAnujanrefers us to the incident of pUtanA, SakaTAsura, lifting of govardhana giri at the tip of the finger, etc. tiruvAi mozhi 6.4 is full of these incidents. SrIrAdhAkRshNa SAstri points to the incident of rukmiNi svayamvaram as an example of the quickness of action that He displays. SrI cinmayAnanda gives the interpretation that He reaches His devotees fast the moment they think of Him because He is everywhere and all-pervading. SrI Sankara interprets the nAma in terms of the ISopanishad declaration "anejadekam manso javIyah - He is unmoving, but at the same time faster than the mind". The context here is that He is inside us, but no amount of reasoning with our mind can decipher Him and figure Him out. He cannot be understood by reason and logic alone, since even a life-time of reasoning with the mind that is faster than anything that is known, will not result in realizing Him. b) He who gives unlimited supply of food to His creations..
amitam aSnAti iti amitASanah - One who eats huge quantities. SrI BhaTTar points out that Lord kRshNa displayed His greatness, among other acts, by swallowing the unlimited quantity of food offered to govardhana giri, making the cowherds exclaim in wonder - "devo vA dAnavo vA tvam" - "Who are you - adeva or an asura?" - vishNu purANam 5.13.121. SrI v.v.rAmAnujan refers us to divya prabandham - aTTuk-kuruvi SORRup-paruppadamum tayir vAviyumneyyaLarum aDa~ngap poTTattuRRu - One who in a fraction of a second consumed a huge amount of rice heaped like a mountain, a huge amount of curd that looked like a canal, ghee that was poured like a big puddle, plenty of vegetables, etc. 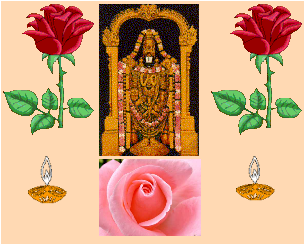 (periyAzhvAr tirumozhi 3.5.1), and to "kArEzh kaDalEzhmalai Ezhulagu uNDum ArA vayiRRAn - tiruvAi mozhi 10.9.2. This nAma issimilar to nAma 304 - mahASanah. SrI Sankara interprets the nAma in terms of His swallowing the whole Universe at the time of praLaya. SrI rAdhAkRshNa SAstri points out that there is nothing that He cannot digest, since He is the jATarAgni thatdigests the food that every being consumes - aham vaiSvAnaro bhUtvA ....pacAmyannam caturvidham (gItA 15.14). The dharma cakram writer points out that we can neither live and grow without eating, nor live without digesting the food we eat, and both are made possible by Him, and this is siginified by this nAma.SrI satyadevo vAsishTha gives the above interpretation, as well as analternate interpretation - amitAn prANinah ASayati = bhojayati itiamitASanah - He is amitASanah because He gives unlimited supply of food to His creation, which is itself immeasurable.